The pumpkin recipes continue in our home. We've still have a lot of pumpkin puree to go though after the boys each brought home a pumpkin from their field trip. I recently shared with you some Soft Baked Pumpkin Cookies I made that were a huge hit. 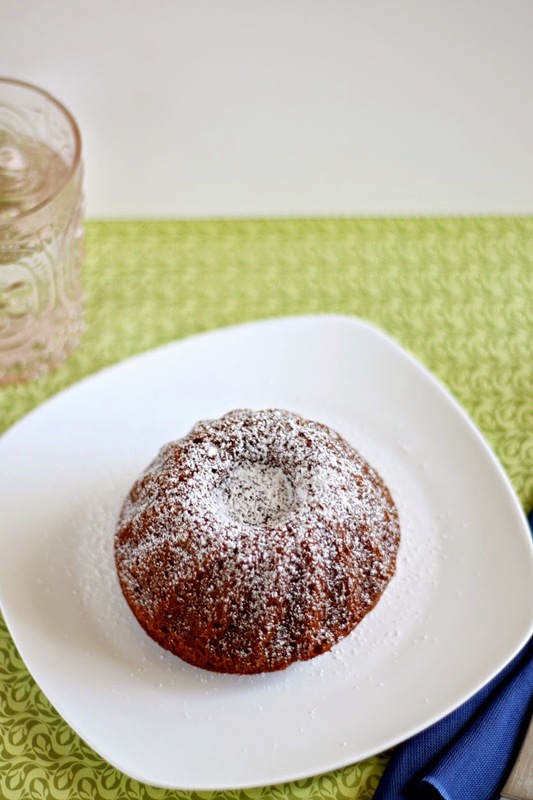 Today I'm sharing Mini Pumpkin Bundt Cakes. I saw this recipe last year on My Ninja Naan. They looked so cute. The original recipe topped the cakes with a chocolate glaze. Henna skipped this step and I totally agree. The cakes are delicious on their own and any sort of glaze would overpower it. The cakes turn out very moist due to the oil and pumpkin puree. This recipe makes a lot for our family. You will get about 12 mini bundt cakes. I made 5 mini bundt cakes and thirty tea cakes. Next time I would make half the recipe. I will be having some more pumpkin recipes coming up in the next couple of weeks so make sure to come back to check them out! Preheat oven to 350°F. Spray a mini bundt pan with cooking spray. In a small bowl, whisk together flour, baking soda, cinnamon, cloves and salt. In the bowl on an electric mixer fitted with the whisk attachment, add the eggs, sugar and vanilla. Combine on medium speed until light and fluffy, approximately 2 minutes. Turn the speed down to low and slowly add the oil. Increase the speed to high and beat for 1 minute. Switch to the paddle attachment. Add the pumpkin puree. Mix on medium speed until combined. Add the flour in 3 batches, mixing on low until just combined. Transfer to the prepared pans and bake for about 20 minutes or until a toothpick inserted in the center comes out clean. Let cool for 10 minutes and then transfer to a wire rack to cool. If you are using a large bundt pan, bake the cake for approximately 45 minutes. Sprinkle some icing sugar on top and enjoy! Oooh Asi these look so good mashAllah! I'm so happy that you enjoyed them :) I'm planning on making these for this weekend; we have some friends coming over for dessert inshAllah, so I was thinking about making these and maybe some banana bread. Did you try making it as a cake? I wonder how it would turn out. Adorable! Mini bundts are so cute. I don't have a bundt pan but would still like to try sometime - how did you make your tea cakes, in a muffin tin? So cute- can't wait to try this!